One could definitely say Aaron has learned to appreciate the simpler things in life, especially as The Naked and Famous’ journey grows more exciting, opportunity-filled, successful and complicated. Continuing my conversation with Aaron, he then talked about the New Zealand-native Indietronica band’s big move to Los Angeles. “Between the time we left New Zealand for our Passive Me, Aggressive You tour in 2010 and landing in Los Angeles in 2012, is a blur of 200 or so shows around the world. We were very ready to pick a spot to settle once we reached the end of it, and LA made sense to us for many reasons,” explains Aaron. The favorable turn-out of their career in the U.S. provided one motivation for the band to stay in this country, and Aaron even mentions they did not want to “stray too far from a good thing.” Additional motivational factors include affordable avocados, rapid internet connection, and a peaceful house just outside of Hollywood. In this home, the band transformed one of the rooms into a little demo studio, a room that would become the birthplace of their latest album, In Rolling Waves. While The Naked and Famous work towards completing their Australian tour, and what is most likely the band’s current chapter, I examine the earlier chapters of this band’s life through Aaron’s point of view. 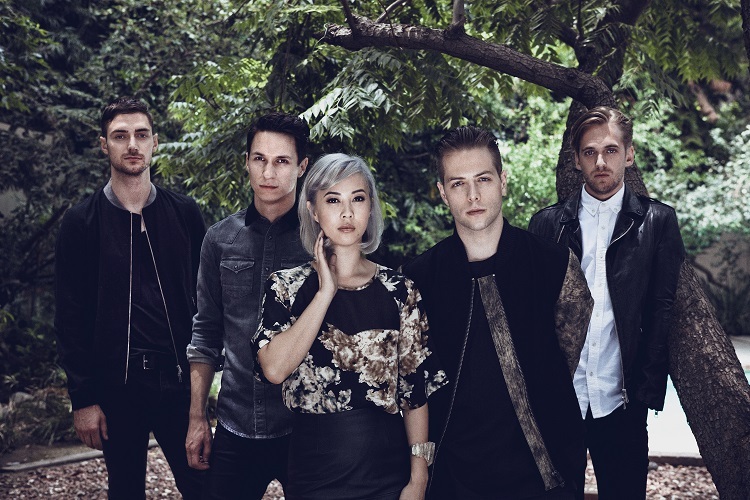 I am happy to welcome The Naked and Famous to Music Historian’s Hear, Let’s Listen. When Aaron met Thom Powers and Alisa Xayalith at Auckland’s MAINZ music college in 2008, he did not consider himself a part of the band, nor really a musician. 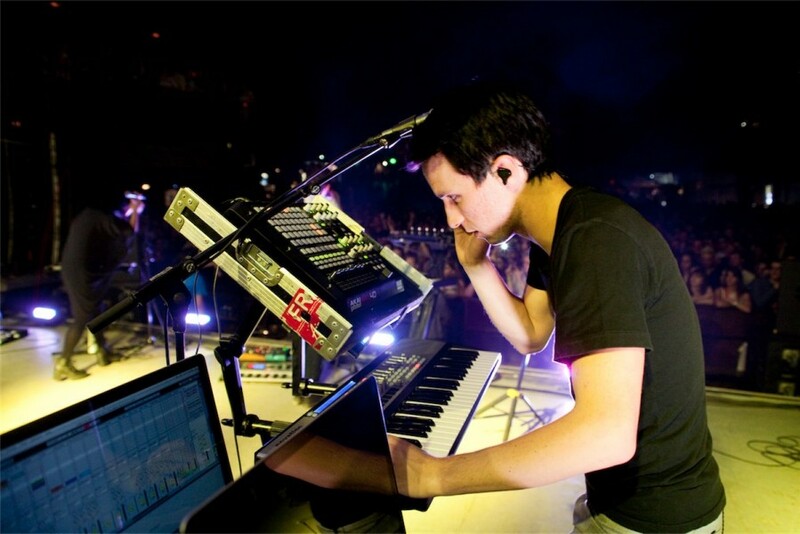 Instead, Aaron saw his future in co-producing within the studio environment. He credits Thom for being a “man with the plan.” Aaron recalls the moment they finished the band’s first EP titled This Machine. I wondered what Aaron meant by a “live band.” He explains, “Since day one, we’ve always had a rule that if something can’t be performed live, it shouldn’t really be in the recording. This law we followed was definitely more for us than the audience, and it dramatically changed our approach to writing, the way in which we recorded albums, and the live set up. Learning this fact about The Naked and Famous’ approach to music also excited me. Based on what I initially understood from reading major popular music publications online; In Rolling Waves was the album that first incorporated this emphasis on the ability of successfully playing a song both live and in a recording. Luckily, the band has been doing this from the beginning. Moving forward with the conversation, I wondered what changed in the recording experience of the band’s latest album compared to their first full-length debut in 2010, Passive Me, Aggressive You. 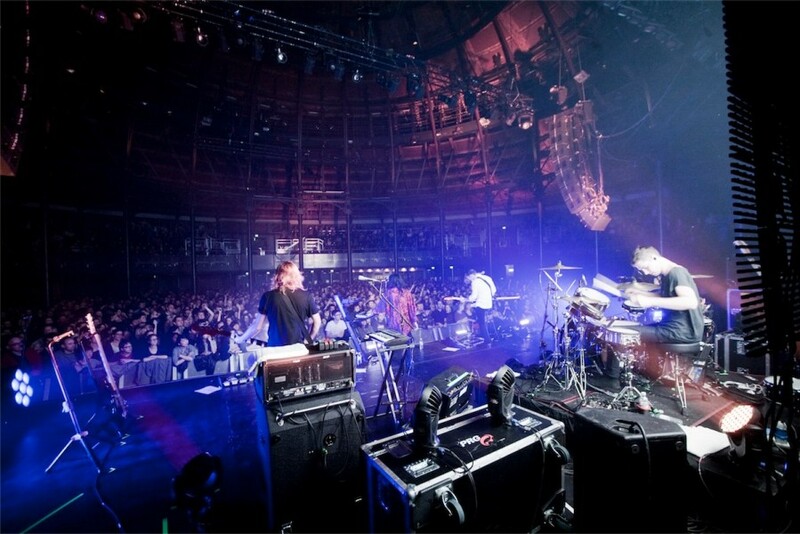 When The Naked and Famous were writing their debut, the five members who – as Aaron explains – “draw from a massive range of musical influences” came to agree on one musical style. “There is also this encompassing sense of being a little more grown up this time around. “Young Blood” was written as a demo in 2009, and we were 4 years on from that when In Rolling Waves was completed. You can definitely feel that in the themes of the lyrics, and the construction of the songs. One might say that time will change anybody’s attitude about their lover, life or even themselves. The same applies for artists. For The Naked and Famous though, their experiences as full-time professional musicians between 2009 and right now speaks louder than only the time that has passed between their album releases. Now, the band can expect plenty of additional mobile uploads from fans after “conquering two incredible weekends at Coachella” something the band has looked forward to for years. They are currently touring Australia, which according to Aaron, has involved enduring colder weather than they are typically used to, along with an overloaded van and plenty of long drives. While Aaron did not mention anything in regards to a live film of the In Rolling Waves tour, fans can keep up with the band by following The Naked and Famous on Twitter – @tnaf – and Instragram – @tnaf. In the meantime, more information about their tour is available on their website thenakedandfamous.com. If you are a New Yorker, you have a chance to see The Naked and Famous perform amongst an exciting line up which includes Jack White, The Strokes, Fitz and the Tantrums, and many more on Saturday, June 7th at the Governors Ball Music Festival. Click here to get tickets. I feel fortunate to have caught one of the members of a band that is currently experiencing a riveting stage within their career. In addition, my conversation with Aaron reminds me of a piece of advice I received once during my time as an undergrad in Music History – “do what you love, and the rest will come.” Aaron’s experience perhaps parallels these words well.